No matter how you slice it, planning a long business trip can be challenging. If you’re coordinating extended business travel for yourself, one of your employees, or an entire company, there are plenty of logistics to think about, including lodging, costs, safety concerns, health, etc. To make the task easier on you, here are 5 helpful tips for planning an extended business trip for yourself or your staff. Sometimes, last-minute trips are unavoidable —but the sooner you can make travel arrangements for an upcoming trip, the better. You’re more likely to get better rates on airfare and lodging by booking early, and you may also be able to redeem travel rewards to save even more. Longer trips require a bit of pacing to keep yourself or your employees healthy and to prevent exhaustion. Try not to “hit the ground running”; instead, allow a day of downtime between travel days and work days to take a breath and regroup. While on the trip, be careful to allow enough space between appointments, and if the trip lasts more than a week, be sure to schedule days off. If things get hectic during a business trip, it can be easy to lose track of expenses. Try to adopt some sort of system to help you and your team keep track — not only to stay on budget, but to make sure you’re able to claim eligible deductions later. For extended stays, short-term corporate housing is a safer, more affordable alternative to expensive hotels — plus working with a corporate lodging provider makes the entire process of coordinating extended business travel much easier because the lodging details are handled by a professional. If you’re trying to coordinate a business trip to Atlanta or Jacksonville, TP Corporate Lodging can arrange for you and your team to stay in fully-furnished, comfortable apartments for less than the cost of a hotel. Give us a call at 800.428.9997 to learn more. For extended business trips, company transfers, transitional housing or temporary housing during a home renovation, choosing a furnished short-term corporate rental is often a more comfortable and affordable option than staying in a hotel. Corporate lodging offers all the comforts of a “home away from home” so you can relax during down times and stay healthy during extended business trips or other times of transition. That being said, not all short-term housing options are created equal. Some corporate housing firms operate with terms you may be uncomfortable with; others may nickel-and-dime you with hidden costs or simply don’t offer the types of furnishings you need. To ensure the best possible experience and the best value for the money, we offer the following tips for choosing corporate lodging. With any temporary extended stay, there are a number of logistical things you must consider (for example, knowing what to pack, forwarding mail, etc.). The following list of 8 things to do before moving into temporary housing should help you stay on track. What furniture is included in your apartment? Is there any additional security deposit? Which utilities are included in the rent? Are vacuums, kitchen utensils and cleaning supplies included? Can I request certain furniture pieces? Are there any hidden costs? When talking with any corporate lodging agency, you need to ask these and other questions to make sure there are no unexpected surprises. We’ve put together a checklist of questions that should help. Airbnb can be a great resource for finding furnished homes and apartments for cheaper rates than a hotel, but not every host on that platform operates up to Airbnb’s exacting standards. For the most consistent experience, make sure the host you choose is a certified corporate lodging agent. This article explains how in further detail. For best results, try to work with a corporate lodging agent with specific experience in the city you’re traveling to. For example, if you’re looking for a good corporate apartment in Atlanta, a local agent will have the inside scoop on travel times, traffic patterns and the best corporate housing options in Atlanta. Likewise, if you’re traveling to Jacksonville, Florida, a localized agency will have the best info on top corporate housing in Jacksonville. Whether your extended stay is for business or pleasure, following these tips should help you find the right furnished temporary housing for your needs. If you’re looking for the best corporate lodging options in Atlanta or in Jacksonville, TP Corporate Lodging can help. Give us a call today at 800.428.9997. If your business or company sends you to another city for an extended stay, temporary corporate housing provides an excellent alternative to expensive and constraining hotel stays. Corporate lodging typically provides a fully furnished apartment rather than a single room or suite, with a fully equipped kitchen and other extras. However, these lodgings naturally work a bit differently than hotels or shared housing platforms like Airbnb. To help you find your bearings and know what to expect, here are 5 important questions to ask before moving into any corporate apartment. 1. What amenities and benefits are included in the price? With temporary corporate housing, you’re moving into an actual apartment or residence, not a hotel room. As a result, you may be trading some advantages for a few luxury amenities provided by hotels that you probably won’t use, anyway. That said, every housing agency operates a little differently, so don’t assume a certain amenity is included — always ask for a list. If the unit is in an established apartment complex, chances are you’ll be able to access most of the amenities that complex provides (for example, a fitness center, pool or community area), but check with your management company first. If you need something that isn’t included, your agency may be able to arrange it for you. 2. Who pays for utilities? If you’re going to be staying on a while, especially, make sure you have this information up front. Some corporate rental agencies include the cost of utilities in the cost of the rent, but some may not. Best to know up front to avoid any unpleasant surprises. Again, you’re staying in an apartment, not an actual hotel with housekeepers. In many cases, housekeeping service is a benefit that is traded off in exchange for a larger, more comfortable living space, as well as to keep your costs down. If housekeeping is not included in the price and you need that service, ask your corporate lodging agent if housekeeping can be arranged. 4. Is the unit pet-friendly? This is a very important question to ask if you’re bringing a dog or cat with you. Some units are pet-friendly, but if you bring a pet into a unit that is not, and that pet causes damage, you may be responsible for extra expenses. Ask in advance; a good agency can usually accommodate this need with pet-friendly lodging. 5. Whom do I call with a problem or maintenance issue? Let’s face it — things happen. A toilet backs up, a dishwasher breaks. Since you’re effectively renting from a housing company rather than the apartment manager, you need to know up front who to call if something goes wrong. Sometimes the agency will have you contact the residential management office; other times they’ll ask you to call them directly. Make sure you know who to call to get your problem resolved — and make sure you’re also provided with an after-hours phone number for emergencies. At TP Corporate Lodging, we go the extra mile to make sure your home-away-from-home meets all your needs, and we make sure you know what’s included and who to call if you run into trouble. To learn more about our available corporate housing in Atlanta and Jacksonville, call us today at 800.428.9997. It’s a situation none of us wants to think about, but occasionally homes do get destroyed or rendered uninhabitable by fire or natural disaster. If it happens to you, it can feel like the end of the world. Even if no one was hurt, you’re facing the potential loss of many belongings, possibly of sentimental value — not to mention the question of finding temporary housing for your family and yourself while you figure out what comes next. The good news is that if you carry a good homeowner’s or renter’s insurance policy, there is probably a provision in there that allocates funds for temporary housing in the event of fire or natural disaster. You’ll usually find this provision under a “loss of use” coverage clause or even “additional expenses.” (If your current policy doesn’t provide this coverage, we highly recommend getting one that does.) By default, many insurance companies (and homeowners) assume that “temporary housing” means putting your family up in a hotel while repairs are made to your home. But this poses another set of problems: What happens if you can’t move back home for months? Is your family supposed to stay in a cramped hotel all that time? And since hotels are expensive, what if the hotel costs are more than your coverage allows, whether as a daily rate or a total amount? This dilemma can be solved by another, better option: Obtain temporary housing through a corporate housing agency. Instead of defaulting to a hotel, you and your family can stay in a fully furnished luxury apartment. This option gives your family plenty of space and all the comforts of home — not to mention any additional amenities offered by the apartment complex — and your insurance company will love it because it usually costs significantly less than a hotel stay. Your insurance company handles the arrangements with the housing provider directly. This option is the easiest because you just get to move in without worrying about up-front costs. If your policy works this way, you may need to advise the insurance company of your wish to stay in corporate housing so they don’t put you in a hotel by default. You file a claim and the insurance company reimburses you. This option requires you to pay upfront for your housing, but you get it back eventually. You obtain an advance payment from the insurance company. If your insurance provider wants to reimburse your claim, you may be able to get them to advance you part of the money up front. This option provides a suitable compromise if you don’t have the money to pay out of pocket initially. Corporate housing may not be covered in the event of flood. Most homeowner’s and renter’s policies don’t cover floods. If you live in a flood-prone area, you may be required to carry separate flood insurance FEMA’s National Flood Insurance Program (NFIP), but this provision also doesn’t cover additional living expenses like temporary housing. If you’ve been displaced by flood, contact FEMA to find out your best options. Read the fine print of your policy — before disaster strikes. Don’t assume your housing is covered in the event of a disaster; make sure of it. Find out how much money your policy allows for additional living expenses or loss of use, and find out whether the insurance company prefers to handle the arrangements or reimburse you. That way, you’ll be prepared for what happens with fewer surprises in the event of a disaster. In Atlanta or Jacksonville, TP Corporate Lodging will work with your insurance company to get your family into a comfortable, fully-furnished temporary apartment in the event of fire or natural disaster. To learn more, call us today at 800.428.9997. Atlanta is a city full of life and texture, including many new and historic homes. Sometimes a renovation or remodeling project can make your home unlivable or highly inconvenient for extended lengths of time. At other times, if you’re building a home, the construction timeline may be delayed due to weather, supply shortages or any of a number of other factors. These temporary inconveniences will be worth it in the end, but what do you do when your living situation is in transition? Let’s explore a few options for short-term furnished housing for Atlanta renovations. By default, many families choose to book rooms in a nearby hotel while their home is going through renovations. Some hotels are indeed geared for extended stays, offering larger suites, kitchenettes and even small apartments. However, this may not always be the best choice for your family. For one thing, hotels come at premium rates, including amenities and services you’re not even likely to use — and even extended stay hotels can get costly over time. Plus, if your renovations go over time or over budget, it doesn’t take long to deplete any savings you’ve accumulated over time. These days, online platforms like Airbnb are providing a popular alternative to expensive hotels by allowing people to list extra rooms, apartments and even houses for rent. Here in the Atlanta area, it’s fairly easy to find a fully-furnished place large enough for a family, usually for less than the cost of a comparable hotel suite. While this option has its advantages, there are ongoing questions about quality control as some people find their apartments aren’t as advertised, or their hosts don’t take good care of them. Airbnb is taking steps to reduce these risks, but it still may take a little bit of vetting to find the right room. Here’s a third option that many people overlook or are unaware of: work with a corporate housing agency to procure short-term housing. This type of service is frequently used by companies or employees staying on business, but it actually works quite well for families in transition, as well. (In fact, some people stay in short-term corporate housing during relocation while looking for a permanent place to live.) A corporate lodging agency arranges for you and your family to stay in a fully-furnished apartment in the Atlanta area, usually with full access to the amenities of that complex, for a fraction of what a hotel usually costs. This options basically gets you the comforts of home for however long you need it, without breaking the bank. If you’re in the midst of an Atlanta home renovation and need an option for short-term housing, TP Corporate Lodging is here to help. To learn more about availability and rates, give us a call at 800.428.9997. When you’re bringing a full film crew to another city for a production shoot, the fewer details you have to worry about, the better. Here in Atlanta, which has in recent years become one of the busiest film production hubs on the planet, there’s a constant challenge to find enough available short-term housing for incoming film professionals (and sometimes their families). Finding creative ways to fill this need — within budget — can be a full-time job in itself. One great way to solve the problem is to work with a corporate production housing partner — an agent or company who can make these arrangements for you. Here are some tips for finding the right company to work with. To be clear: For best results, you don’t need a “booking agent” or glorified travel agent whose job it is to book enough hotel rooms or Airbnb to cover your housing needs. That strategy can be costly, deliver inconsistent results and may not give your team the level of comfort they really need for an extended shoot. For any shoot lasting longer than a week, look for agencies that specialize in fully furnished apartments at corporate rates. That way, you can be better assured your team will rest more comfortably at night and come to the set refreshed and ready to work. A local corporate housing company knows the various neighborhoods and “hotspots,” knows your prospective filming locations and knows which apartments would be most comfortable and convenient for your team. A local agency will have solid, trusted working relationships with apartment complexes across the city, making it much easier to procure sufficient housing in a short amount of time. Film productions are stressful enough on their own, even at those rare times when things are going exactly as planned. Don’t add to the stress of your Atlanta film shoot by taking on the burden of finding housing for your crew. TP Corporate Lodging can be your trusted corporate housing partner to make sure your team can live and rest comfortably without breaking the bank. To learn more, call us at 800.428.9997. In recent years, Airbnb has gained a lot of steam as a platform to find comfortable lodging as an alternative to more expensive hotels. It can be very useful for families to find vacation rentals or for business travelers to find affordable places for extended stays. It’s also a way for private individuals to make a little extra income off their property — and, ironically, here’s where the challenges lie. Even with robust screening in place, it can be difficult for Airbnb to monitor quality control for the individual renting their place for the weekend versus a certified corporate lodging partner with consistent standards (like TP Corporate) who also may be using the site. Fortunately, there are a few ways to find certified corporate lodging on Airbnb while weeding through the many private listings that may or may not be as advertised or up to your standards. Here are some tips. Unbeknownst to some, Airbnb has a specific portal for business travelers to find great places to stay on business. This presents a great opportunity to find lodging that is especially work-friendly, and you’re more likely to find a higher concentration of listings there by corporate lodging agencies. In an effort to improve quality control across the site, Airbnb has launched Airbnb Plus, a new classification guaranteeing the highest quality standards in their listings. Plus listings have a history of consistently high reviews and are personally visited by Airbnb staff to pass a 100-point inspection. Many corporate lodging partners qualify for the “Plus” ranking, so this is also a good way to find them. When you come across a listing on the site that seems to check all the boxes for you, dig a little deeper and click on the host icon. Find out whether it’s an individual or a business and whether they have multiple properties available. This is also a good way to identify a company providing quality corporate housing. Many users have had good experiences all around with Airbnb, which is one reason the site is so popular. However, a few bad apples still slip through the cracks, and when you’re trying to make quick plans for business travel, you want to be certain you’re getting a good unit and a good host without having to do hours of research. The best way to do that is to find a reliable corporate lodging partner with a track record of quality. If you’re heading to Atlanta or Jacksonville on business and need reliable, affordable lodging, call TP Corporate Lodging at 800.428.9997. If you’ve ever worked on a major film production, you know that it’s a huge undertaking. A film production is part creative tribe and part business — and when you bring a cast and crew to shoot on location, it’s like setting up a small city. All of those people need comfortable housing, sometimes for months at a time. Atlanta is known for its hospitality for film projects, but even so, finding affordable lodging for so many people can be a real challenge. Here are some options to explore to find housing for your Atlanta cast and crew. The first option is to work with a corporate lodging partner to arrange for your cast and crew to stay in temporary housing in Atlanta. This option works very well for productions because the lodging company handles the housing details and provides fully furnished apartments to house everyone on your team — at a fraction of the cost of booking hotels for everyone. Your cast and crew will feel more at home, which means they can stay comfortably for months at a time, if need be. In addition, quality standards remain consistent across the board because you are working with a single agent to provide housing for everyone. Hotels are very expensive for what they offer. Few things can deplete a film budget faster than film crew housing. Hotels aren’t comfortable for extended stays. Living in a hotel room isn’t like living at home — and after several weeks, this can affect the team’s overall morale. Hotel availability can be unpredictable. 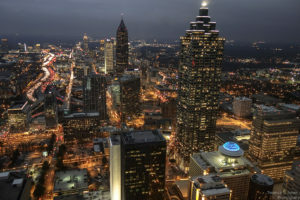 Atlanta is a busy city with hundreds of events going on at any time. If your production is fairly large, there’s a chance you won’t find enough rooms to accommodate everyone for a long period of time. Using Airbnb can be more labor-intensive. Finding individual units for everyone on your team can be quite time-consuming — and housing everyone close together may be impossible. Quality standards are inconsistent. Many users report less-than-stellar facilities and experiences with landlords. The cost savings versus labor isn’t always efficient. Even if you save a few dollars over the hotels, the time involvement procuring the housing may not be worth it. If you’re trying to find housing for your Atlanta film cast and crew, TP Corporate Lodging can help meet the need without draining your budget. To learn more, call us at 800.428.9997.